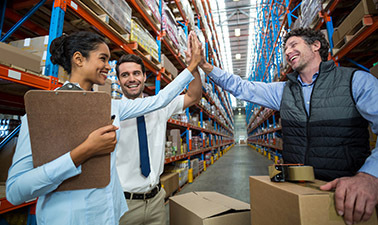 Part of our three-course professional certificate program on The Science of Happiness at Work, offered through the premiere online learning destination, edX. The course launched in early September, but is still open for registration through November! The next session of the course will launch January 8, 2019. This four-week course explains what happiness at work looks like, why it matters, and how to cultivate it. The Foundations of Happiness at Work is led by two celebrated teachers from the Greater Good Science Center: Emiliana Simon-Thomas, Ph.D., the GGSC’s science director, and GGSC founder Dacher Keltner, Ph.D., who is a psychology professor at UC Berkeley and author of the best-selling book Born to Be Good. Thei GGSC's online course, The Science of Happiness, has been a global phenomenon, introducing a half million students worldwide to the research-based keys to a happy, meaningful life. In this course, they tailor their scientific insights to the needs of the modern workplace. The Science of Happiness is a recommended prerequisite. The Foundations of Happiness at Work is an instructor-led four-week course. However, the course will be available to registered students for two months after September 2018 launch date for those unable to complete the course in four weeks. The Science of Happiness is hosted on the edX platform. To sign up, you need to create an edX account and then register for the course on edX. 10 units of continuing education are available to psychologists, social workers, MFTs, therapists, counselors, nurses, human resource professionals, and others! More info is in the Continuing Education tab above or purchase directly here. Please note this course is free; simply choose "Audit This Course" to register at no charge. However, edX (the online education platform which hosts the course) also offers a Verified Track for $149. The course is identical, but you'll receive a certificate of completion when you finish the course. This online course is approved for 10 CE credit hours for psychologists, therapists, social workers, counselors, nurses, HR professionals, and others (see below). Continuing Education for this course is co-sponsored by R. Cassidy Seminars. 1. Register for CE credit through the course’s continuing education co-sponsor, R. Cassidy Seminars (RCS). When you register for CE credit, you will create a login through the RCS website. 2. Follow this link to register separately for The Foundations of Happiness at Work for free on edX, the platform that hosts the course. Choose the "Audit This Course (No Certificate)" registration option. You do not need to register for a Verified Certificate, which does not provide CE credits. edX offers the Verified option to those who want proof that they completed the course (for non-CE purposes). OH: Provider approved by the Ohio Counselor, Social Worker and Marriage and Family Therapist Board for (10) clock hours, #RCST110701. IL: Illinois Dept. of Professional Regulation, Approved Continuing Education Sponsor, #168-000141. (10) hours. NY-LMHCs:R. Cassidy Seminars is recognized by the New York State Education Department’s State Board of Mental Health Practitioners as an approved provider of continuing education for licensed mental health counselors. #MHC-0015. (10)) contact hours. NY-LMFTs:R. Cassidy Seminars is recognized by the New York State Education Department’s State Board of Mental Health Practitioners as an approved provider of continuing education for licensed marriage and family therapists. #MFT-0011. (10)) contact hours. OH: Provider approved by the Ohio Counselor, Social Worker and Marriage and Family Therapist Board for (10)) clock hours, #RCST110701. TX: Approved CE Sponsor through the Texas State Board of Examiners of Marriage & Family Therapists. 10credit hours. Provider #151. This activity, ID No. 362524, has been approved for 10 HR (General) recertification credit hours toward aPHR™, PHR®, PHRca®, SPHR®, GPHR®, PHRi™ and SPHRi™ recertification through HR Certification Institute® (HRCI®). Please make note of the activity ID number on your recertification application form. For more information about certification or recertification, please visit the HR Certification Institute website at www.hrci.org. CA: Provider approved by the CA Board of Registered Nursing, Provider #CeP12224, for (10)) contact hours. TX: R. Cassidy Seminars is an approved provider with the Texas Education Agency CPE# 501456. This course is (10)) CE Hours. [AOTA] R. Cassidy Seminars is an AOTA approved provider # 6782. The assignment of AOTA CEUs does not imply endorsement of specific course content, products, or clinical procedures by AOTA. Occupational therapists will receive a certificate of completion for (10)) CE hours. 1 CE hour(s) = .1 AOTA CE(s).